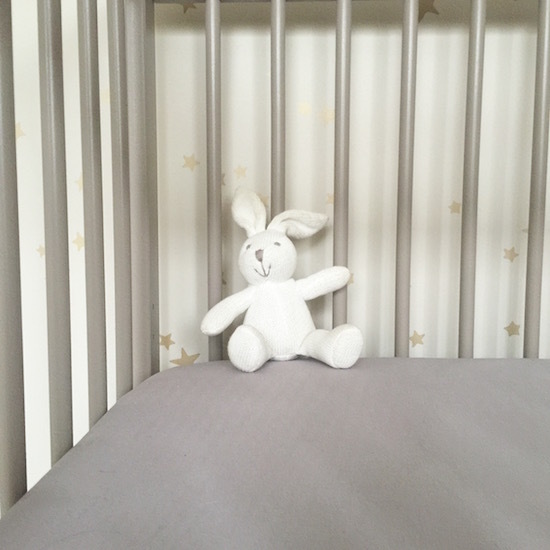 I’m very behind with this post, we moved Angelica into a cot just after the New Year (into her own room three weeks ago), I just haven’t had time to write about it! The Snuzpod bedside crib we had her in since birth was just absolutely brilliant; it honestly made life so easy having her right next to me. No lifting in the night, just sliding the baby across – which is unbelievably helpful, especially if you’ve had a C-Section and you’re finding it hard to get up. But the baby was the same length as the Snuzpod by six months, so it was time to start looking for a proper cot. I also had started to feel a bit “hemmed in” by the bedside crib – having to shimmy down the bed to get out, not having a space next to me to put a phone or glass of water or Kindle. I was quite eager to get back to normality, in terms of my sleeping situation. But I still wanted to have the baby in the same room – I was ready for bedside space, but not quite ready to stop being roommates – and space in our bedroom is, to put it nicely, “at a premium”. It’s not so much that it’s a small room, more that the stuff in it is large. So one of the main criteria for a cot was that it was petite. I actually looked at some of the space-saving cots, but Angelica is quite tall and I thought that it might be a false economy to keep on having to change her bed every time I moved her! All cots appeared to be about 120cmx60cm, which was fine, but I was also tempted by the idea of a cot bed, which would convert into a little mini bed, meaning that it would be used for a much greater length of time. But the cot beds were all 140cm – I would have been climbing into the bloody thing to get out of the door! Oh, I spent hours researching cots on my iPhone throughout my nighttime breastfeeding sessions (they were still happening – lots of them – until three nights ago, when she started to sleep through, post on that soon) and came to the conclusion that I’d have to get a standard cot because a cot bed simply wouldn’t fit. But then I stumbled across the Mokee website*. 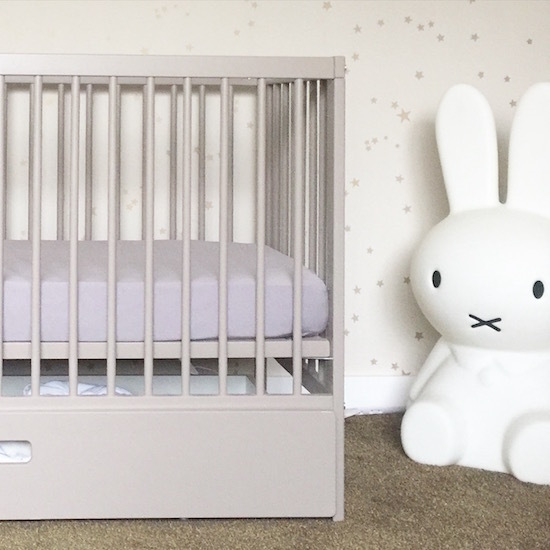 Mokee make minimalist nursery furniture in beautiful colours (it’s sort of Farrow and Ball meets Heals) and they have a cot (120x60cm) that actually transforms into a bed with a quick removal of a side panel and addition of an extra strut. Marvellous – problem solved. 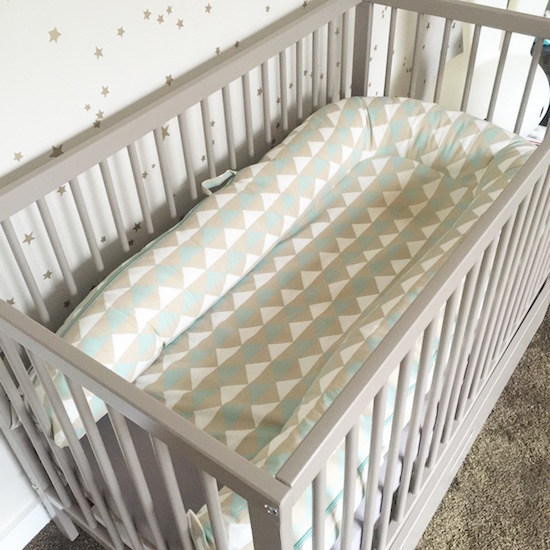 It was love at first sight when it came to the website; I hadn’t seen many other cots displayed in such an attractive way – very Instagram-friendly – and I loved that the finish options were all so pretty and expensive looking. The cost of this picture-perfect cot? £69.95! The design of the Mokee is pretty simple – there’s no drop-down side, but then I didn’t want one of those anyway. There are various mattress heights, the build quality is great and the cot is easy to put together. (Easy as in, you may need two of you, but you won’t kill each other out of frustration. Not easy as in “try to build it on your own when you’re nine months pregnant, but then you should be putting your feet up if you’re nine months pregnant. Let someone else do it.) A particular bonus, for me at least, is that you can buy a colour-matched drawer to slide underneath the cot – it’s big enough to hold just about all of the linen you need for the mattress as well as your sleeping bags and emergency muslin cloths and so on. I’ve started bunging all kinds of things in my drawer – books, odd socks, credit card bills… Give me a drawer and I will fill it with crap. The Mokee is pictured with a Sleepyhead Grand inside (online here) – it fits very nicely and there are new covers for the Grand with gorgeous designs. I did try and wean the baby off the Sleepyhead, but then they sent me the Grand to to review (post coming soon) and I’ve got the same baby-with-Sleepyhead-addiction problem all over again. She bloody loves it. Snug as a bug in a rug. My Mum thinks she should be free to roll over and do her cot gymnastics but when I take the Sleepyhead away, she wakes up all night long, so… I’m tackling one thing at a time. Mokee also do very lovely co-ordinating cot-top changing mats, castors for the legs so that the cot is more portable, cot linen and mattresses. All at really very good prices – and, though I can only vouch for the linen first-hand, very good quality. You can find the Mokee website here. 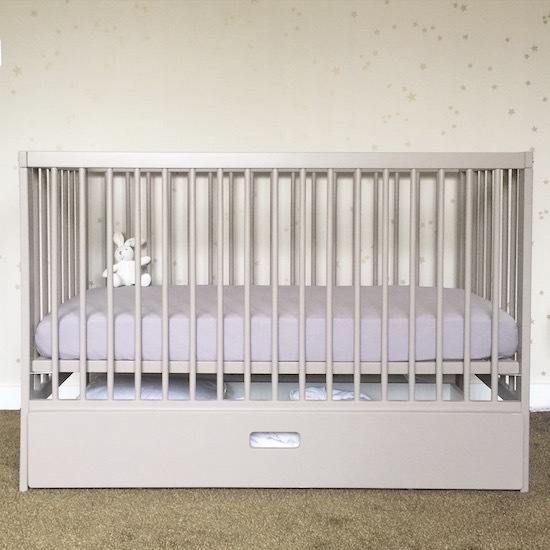 *Mokee very kindly provided this cot and drawer for review but I absolutely would buy this cot many times over – it’s great value for money and so many people have commented on it when they’ve stuck their head into the nursery. The giant Miffy lamp in the pictures is the Miffy XL and was a present from Mr AMR a few years ago. You can still get them online here.